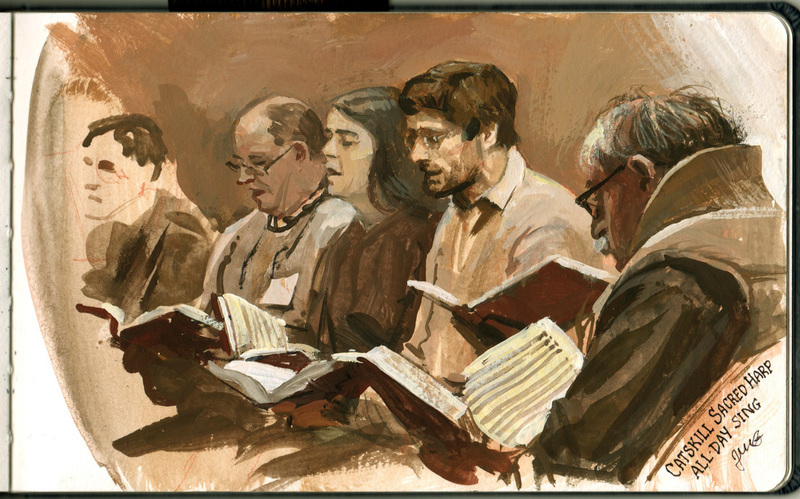 Above: James Gurney, an artist who is best known for best known for his illustrated book series Dinotopia, painted this portrait of singers at the 2016 Catskills All Day Singing on Saturday, Feb. 27 and shared this blog post and video about the process. in Phoenicia, NY. Free and open to the public. Singing begins at 10 a.m. and runs until 3 p.m. with a break for dinner on the grounds around noon. Please bring a dish to pass. Kitchen facilities are available. The Catskills region of New York is home to a young and growing community of Sacred Harp singers. Phoenicia, New York is in the heart of the Catskills Park, a wilderness just 100 miles north of New York City.The Catskills are a popular vacation destination, and there’s lots of hiking, skiing and exploring to do when you’re not singing. Make a weekend of it. Here are some ideas of where to stay, eat and what to do. St. Francis de Sales church and the parish hall are across the street from each other in the hamlet of Phoenicia. The singing is in the Parish hall at 109 Main Street. The Catskills are mountainous and cold in February, so if you're driving, be sure that you're comfortable in snow. The venue and its parking lot are near the main highway through the region and should be accessible in all weather. We'll post weather-based changes in plans for the singing here. Update: The weather is looking good: clear and above freezing for Saturday. Please know that there is no cell phone service in Phoenicia. Phoenicia is a small hamlet in Ulster County, New York, just off State Route 28. From points south, drive north on Route 28 and turn right into Phoencia on Bridge St. Turn right on Main St. — the church is on the right and the parish Hall is on the left. From points north, drive south on Route 28 and turn left onto Main St. at the eagle statue into Phoenicia. Drive through town past Bridge St. — the church is on the right and the parish Hall is on the left. Parking: The church parking lot is across the street from the parish hall, next to the main church building. Additional parking is available for free on Main Street and Phoenicia’s side streets. Parking is free. Train: Amtrak https://www.amtrak.com/home runs from NYC and Albany to several stations in the Hudson Valley, including Rhinecliff, Poughkeepsie and Hudson. All the train stations are a 45-minute drive away from Phoenicia with no public transportation options between them, so if you’re interested in taking the train, you’ll have to coordinate pick-up and drop-off at the station. Contact Julia Reischel at sacredharpcatskills@gmail.com if you are interested in getting a ride and we’ll see if we can set it up. Lodging: See our list of hotels (and restaurants and hikes) here. Make a weekend of it--the Catskills are gorgeous. Hospitality: Contact Jacqueline Purdy, jlpurdy@catskill.net, for hospitality requests in advance, or fill out our online form to request a place to stay at someone’s home. Contact: Julia Reischel, sacredharpcatskills@gmail.com or call 845-586-6183.